Although NYCHA has built more than 100 community centers, each program is specific to the community it serves. 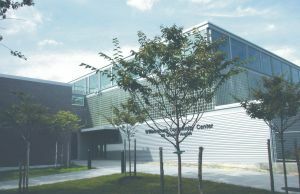 The program for the Williamsburg Community Center was developed by NYCHA and the architects working in partnership with residents and NYCHA's Community Operations Department, although it was conceived and designed to serve the entire Williamsburg neighborhood. It was particularly aimed at attracting youth who account for about 33 percent of the population of the Williamsburg Houses. In general, NYCHA hoped that sports would bring people to the building and encourage them to participate in educational programs and cultural events. 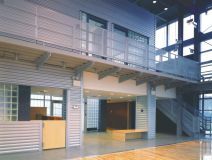 Although spaces for recreational activities, such as basketball and exercise instruction, were major components of the program, the building was designed to accommodate after-school programs that range from computer classes and art workshops to music recording sessions and homework assistance. 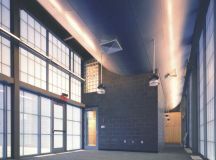 The core of the building is a large multipurpose space and gym that includes a stage for theatre and dance. Other functions are a dance studio, art studios and classrooms. A music-recording studio and a computer facility were added at the specific request of residents. Other amenities include a large movie screen and a commercial kitchen for preparing seniors' lunches. The kitchen was made large enough to cater weddings or other special events. 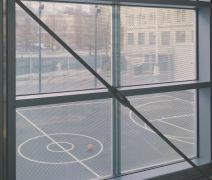 In front of the center are decorative planters and tables for games like chess, and an outdoor basketball court is located behind the building next to the park. In sum, the center contains a multitude of spaces that can be used by neighborhood children, youth and adults. Fitting all of these elements into one 21,000-square-foot building was not easy, and the architects did not want to build a standard rectangular box. Throughout the process, the architects worked hard to maintain the scale, profile and overall concept for their winning design. "We felt strongly that we should engage the community rather than seal the building off from the neighborhood," says Project Architect Larry Zeroth of New York's Pasanella + Klein Stolzman + Berg Architects, P.C. "Instead, we designed the building to reach out. In order to make the building feel bigger, we splintered the typical utilitarian shed into a series of small pavilions that extend from an airy, light-filled multipurpose space." Organized by function, the pavilions spill out into the park and define a series of protected indoor and outdoor spaces that can accommodate a greater range of recreational activities and community services. Some of the most striking features of the building are the transparent walls, which Zeroth describes as "a sort of complement to the solidity of the Williamsburg Houses. The guiding metaphor was the park's existing chain-link fence—a protective material that encloses space but allows open views." Security was a significant issue for NYCHA, and this design particularly fits the bill. Layers of transparency meant that activities outside could be monitored from within and vice versa, without making kids feel like they were being constantly watched. "The translucent and transparent exterior walls provide visibility and foster security within and outside the building," says NYCHA Deputy Design Director Eftihia Tsitiridis. "The center's glass doors and walls are protected by perforated aluminum panels that filter light into the central gymnasium space allowing views straight through." The entrance lobby also doubled as a security area that increased the safety of the building overall. This system infuses the interior spaces with the experience of the surrounding environment, combining physical security with visual permeability. "Walking along the mezzanine offers abundant opportunities for visual connections to the park outside, the school next door and the apartment buildings across the street," Tsitiridis says. Operable screens divide the center into smaller areas so that different activities can occur simultaneously. Translucent panels also line the exterior walls of the pavilions that house the classrooms and computer workshops. Colors were inspired by murals that were originally designed for the social rooms located in the basements of the adjacent Williamsburg Houses. These paintings, which may have been the first abstract murals ever painted in the United States, had disappeared for several decades. The original murals were retrieved in the 1980s, painstakingly restored and turned over to the Brooklyn Museum. Reproductions of two of the murals by artists Ilya Bolotowsky and Balcomb Greene line the elevator and stair lobby on the second level. Complementing the color scheme is a palette of durable and low-cost materials that help to reduce maintenance and limit cost. These include ground-face masonry units, glass curtain wall, glass block, Kalwall translucent panels, preformed metal panels, heavy-gauge perforated screen, and exposed steel and concrete. The result is a community center that is characterized by its simplicity, efficiency and clarity of forms. "These design features give the building its distinct identity as a magnet, a symbol of hope and a beacon of light for residents of the Williamsburg Houses as well as for the community at large," Tsitiridis says.